https://www.freshisreal.com/life-changing-fermented-vegetables/A gorgeous bread recipe that will open your eyes to ingredients you can consume even when on a gluten-free and plant-based lifestyle. You will need a Sorghum Sourdough Starter*** to make this rustic and artisan-style loaf. If you avoid many top allergens because of food sensitivities or allergies, this recipe might be right for you as it is free of gluten, nuts, peanuts, eggs, dairy, and soy. This loaf is also free of corn, rice, oats, legumes and refined sugar. 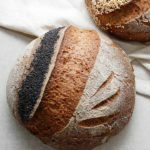 This mostly hands-off 2-day gluten-free sourdough recipe rests in the refrigerator overnight to help breakdown the ingredients to make the loaf easier to digest. The addition of the sourdough starter on day 2 helps to create beautiful dough without making it too sour. For best results, it is recommended to bake the loaf into a Dutch oven. A baking stone is also a great tool to help distribute the heat more evenly but it is optional. See process picture for example. In the evening, in a large glass bowl, sift and mix the dry ingredients listed in Day 1. Add the olive oil and 1 cup of the water and mix well. Add remaining 1/2 cup of water and mix until well incorporated. Cover the bowl and refrigerate, or place in a colder room, overnight (for at least 12 hours). Tip: Make sure you feed your sorghum starter in the evening, so it’s active and bubbly in the morning. The next morning, remove your bowl from the refrigerator and let come to room temperature (about 1-2 hours). Note: If your bowl was already out in a colder room then you’re ready for the next step. Add 1 cup of active fed sorghum sourdough starter, sea salt and beet juice (optional) to the dough bowl. Mix the ingredients with your clean hands until everything is well combined and the dough comes together nicely. Tip: You can gently stretch and knead the dough it in the bowl a few times to then punch it down a bit to help shape it into a ball. Watch this video for example. Transfer dough ball to a tea towel lined soup bowl (approx. 6.25 inches in diameter), fold towel over and place everything into a sealable plastic bag. Move your dough bowl to a warm area of your house. Let rise for about 6 hours until the dough has risen to about an inch over the bowl edge or noticeably increased in size—it will not double. Preheat your oven, your Dutch oven and baking stone (optional) to 450° F for at least 30-45 minutes once your dough is ready to bake. Everything can stay in the bag covered until your oven is ready. Once your oven is hot, and your dough has increased in size, now it’s time to prepare for baking. Transfer your dough (flat side down, round side up) onto a piece of unbleached parchment paper (about 11×13 inches). Dust your dough with sorghum flour, help spread it around with your hands if necessary. With a very sharp knife (or bread scoring blade) score your loaf. If you want to add seeds, you can brush your dough with a little olive oil to help the seeds stick. Remove your preheated Dutch oven from the oven (careful it will be hot) and transfer your dough with parchment paper into the Dutch oven and cover. Return Dutch oven to the oven for 25 minutes covered, 25 minutes uncovered and 8-10 minutes with the loaf directly onto the rack or baking stone (if you used one). You know the bread is ready once you tap the top and sides with your finger and it sounds hard and hollow. Cool on a rack for 4 hours or overnight before slicing! Enjoy! Storage tips: This loaf keeps well on the counter for 1-2 days wrapped in a tea towel. After that slice, the rest and refrigerate it in a bag or glass container for up to 5 days. This loaf does freeze well but slicing it beforehand is suggested before you freeze it. Toasting tips: Gluten-free bread does not toast like regular bread. It does take longer to toast which is why I always use my cast iron pan to make toast now. On medium, to low heat preheat a well-seasoned cast iron pan, place fresh or frozen slices, reduce the heat to low and let your slices toast nice and slow while you carry on with your daily kitchen duties. Once almost ready, turn off the heat to keep your toast warm until you’re ready to eat. *You can grind/mill fresh raw organic sunflower seeds or pumpkin seeds into a fine flour with either a coffee/spice grinder or small blender. If you have a dry container Vitamix that will also work well. Sift the flour to remove larger seed bits and discard or return to the grinder. As an alternative, if you are not nut-free, consider using almond flour or other nut flours in your bread recipe. **The juice from a jar of fermented beets or vegetables. See this lacto-fermented vegetable recipe to make your own. My ferments only contain fresh veggies, packed tightly in a clean glass jar, filled with brine (water and sea salt), pickling spices and fresh garlic. ***If you don’t already have a sorghum starter but do have a gluten-free brown rice starter, consider using it in this recipe, as I’m sure it could work equally well.